Boom Trucks (Bucket Trucks) Market size was valued at over USD 1 billion in 2017 and will grow at over 5% CAGR from 2018 to 2024. For the purpose of this study, boom trucks refer to bucket trucks, which are trucks equipped with a hydraulic, extendable boom that carry a huge bucket for raising workers to elevated, inaccessible areas. Increasing adoption of aerial work platforms such as bucket trucks for home, non-residential building, and government constructions as well as repair & maintenance activities is anticipated to drive the bucket trucks market growth. Electric power is the primary infrastructure for the economic development of any country. Rising government initiatives across various regions to upgrade the existing power grids provide significant opportunities to the bucket trucks market growth. For instance, in September 2017, the Government of India unveiled USD 2 billion Pradhan Mantri Sahaj Bijli Har Ghar Yojana (SAUBHAGYA) to offer electricity connection to nearly 40 million families in urban and rural areas by 2019. These initiatives to upgrade are the result of the increasing demand for high-quality and reliable power. In addition, increasing efforts to develop grid interconnection for countries are currently being witnessed due to the advantages offered such as reduction in the fuel costs and operating expenses. These trucks come in a variety of working heights, making them most suitable for upgrading the power grids. High investments & maintenance costs for the equipment are the key factors hindering the boom trucks market growth. In addition, the equipment is available on lease from the manufacturers in the market at a much lower price than the newer trucks. Instead of procuring new equipment, several consumers commonly prefer purchasing the used equipment, which is anticipated to hamper the bucket trucks market growth. Advancements in engineering have led to the development of bucket trucks, which are capable of taking workers to more than 200 ft. in the air. These trucks enable the power companies to maintain and repair the networks of electric and telecommunication cables placed overhead. In addition, this equipment is for emergency response tasks as well. The trucks mounted on class 8 chassis are categorized heavy-duty trucks with a GVWR of more than 33,001 pounds or 14,969 kg. The bucket truck market for Class 8 trucks is expected to grow at 6% CAGR over the forecast timeline. For rough terrains, repairing wind farms and high-rise installations, these trucks are frequently utilized. Increasing investments by the manufacturers followed by the growing demand for such trucks are driving the bucket trucks market demand. The insulated truck segment is expected to grow at around 4% CAGR by 2024. Growing demand for continuous and reliable energy supply is compelling the industry players in the power sector to keep the trucks on standby all the time to provide uninterrupted power, contributing to the boom trucks market growth. Insulated trucks are majorly used in the utility industry for conveniently and safely putting the linemen to extreme heights to maintain, manage, and enhance the overall electrical power distribution network. The upper and lower sections of the bucket trucks are insulated with the help of a fiberglass coating preventing electricity from flowing into the platform. The flow of electricity into the boom can electrocute the truck operator and can even damage the equipment. Benefits of using this equipment include delivering value to the companies operating in the power sector, responsible for enhancing and upgrading the grid. Construction application segment in bucket trucks market is anticipated to witness growth to reach over USD 500 million by 2024 due to the increasing number of construction projects globally. The safety of the workforce has become a prime issue and stringent standards set by various government organizations tightly monitor the specifications and safety requirements. The use of traditional construction methods and human involvement in construction is forecast to favor boom trucks market consumption. This equipment can function efficiently at great heights, which makes them a suitable option for huge construction projects. Increasing security concerns and various government initiatives to enhance the working environments are also major factors driving the bucket trucks market growth. 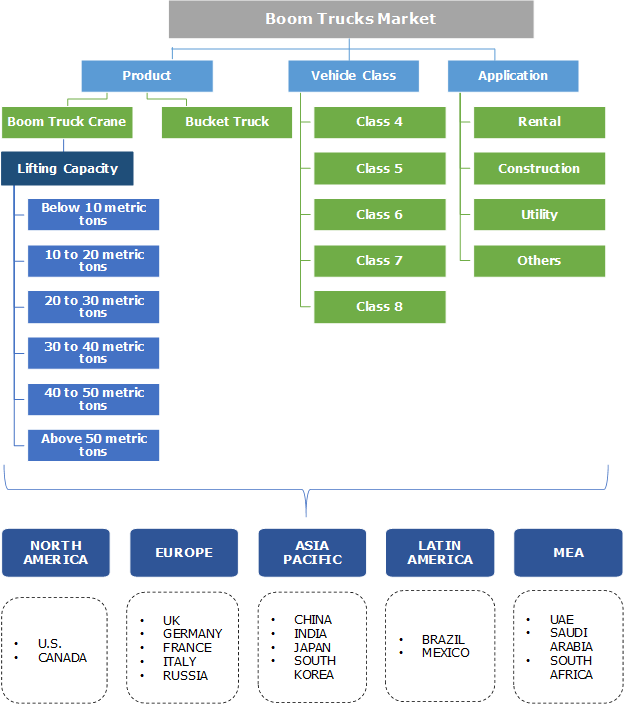 China bucket trucks market is expected to grow at a CAGR of over 5 percent over the forecast timeline. The Government of China is increasingly promoting safety practices and safe equipment usage in the infrastructure development industry. Growing need for accessing the power distribution grids is a primary driver for the boom trucks market growth as they are widely used during construction and maintenance of the grids. Rapid urbanization and steady economic growth in China coupled with rising labor costs are contributing to the bucket trucks market growth in the region. The construction of high-rise buildings in China is generating a demand for the utilization of sophisticated machinery to ensure safety and enhance productivity. Companies, such as HERC Rentals and Shanghai Hongxin Equipment Engineering Co., Ltd., are helping in market growth. Industry players operating in the bucket trucks market include Terex Corporation, Altec Corporation, Palfinger AG, Dur-A-Lift, Inc., Tadano Ltd., Socage S.R.L., and Versalift. The industry dynamics are characterized by intense competition. Product development initiatives are helping in enhancing the company’s operational portfolio, financial, and operational conditions. Furthermore, the companies are increasingly focusing on providing a total lifecycle support for each equipment to maximize the performance and gain returns on investments. The global boom trucks market is characterized by intensive competition among the international as well as regional industry participants. The industry players are primarily focusing on manufacturing high-reach equipment, engineered for incredible stability considering the safety of the personnel. The companies operating in the bucket trucks marketplace are offering customer support services to clients, which provide all the parts, services, and support required to keep the systems running at a peak efficiency with remote access to troubleshoot, identify, and respond to issues with proven support solutions. 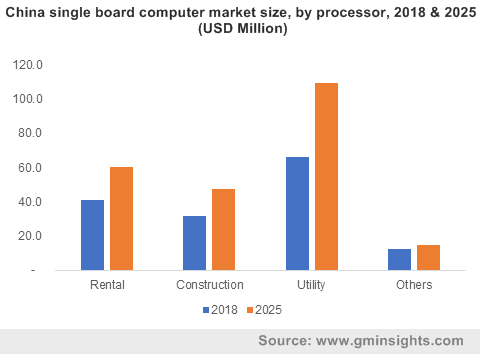 Increasing demand for upgrading of telecommunication and power grid infrastructure across various economies is compelling the industry participants to continuously upgrade and modify the equipment to increase the capacity, throughput, and uptime.